It's been a little while! (: We've been a little busy around here lately so I haven't had much time to blog. My family was here for a week and a half for their first-ever visit to our house and they just left this past weekend. I'll get a post together about their stay here with us soon, but until then, I have an exciting* post ready for you all**! Two points to be made here before we begin: One. This post will only be "exciting*" if you find organization as exciting as I do. On the count of three, give your computer screen some good side-eye and furrowed brows and mutter, "freaaaaaaak". Two. With how often I have been saying "you all**" lately, it's only a matter of time before that phrase becomes a jumbled mumbled mess and simply becomes y'all. But if I start saying "y'all", people will look at me like they looked at Madonna when she tried to adopt a British accent as if she was born and raised there. And that would just be too much side-eye for me to handle. I know I've mentioned before that our house is a little quirky. I really love it and I know I will be totally bummed when we move some day (which is nowhere in the foreseeable future, but it will happen eventually, I'm sure). But even though I really love our house, it does have its quirks. The kind that make you scratch your head and wonder "why?" Our pantry is no exception. 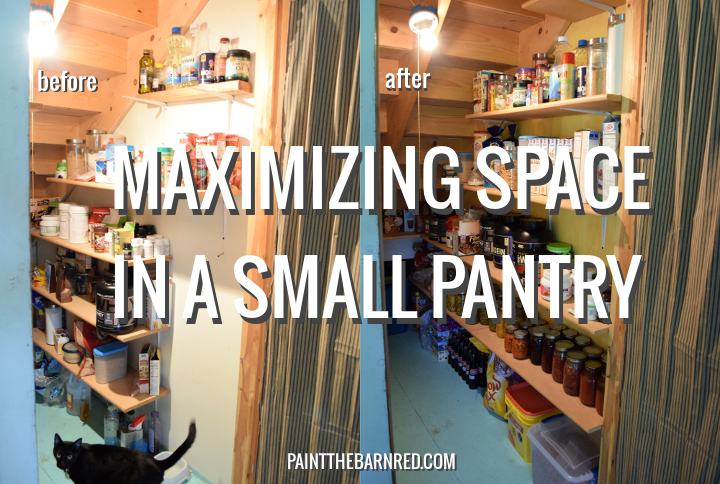 By all matters of appearances, our pantry is your run of the mill, smallish, under-the-stairs storage space. Look! It even has an old school patio screen door (which is hands down my favorite part about it)! And it really is pretty normal for a pantry. It's the shelves inside it that made my insides groan with confusion. Oh look, my giant tub of whey is saying "HEY". The contents of my pantry are so cordial and polite to guests. At a first glance inside it's still normal. A little messy and nothing Pinterest-pretty, but it looks normal. Functional. Right? Name that movie and I'll give you a soft pretzel for movie quote skill level: Expert. The pantry looks normal until you see it from the side. Any side. Notice how not one of the shelves reaches the wall and they're placed on the wall all willy nilly. ...And is that a 2x4 for a top shelf? Sidebar: those are our cats in the above pictures. I'm a self-proclaimed (and others have proclaimed) crazy cat lady. This whole project was a really just a big impromptu decision on my part. I'm not too sure if husband was sold on the idea at first, but I started emptying the entire contents of the pantry and then there was really nothing he could do about it except to start cutting the boards to size for me. We're very appreciative of his handy man skills around here, I tell ya. With the pantry totally empty, you can really see just how much of an odd placement the shelves were in to begin with. Don't ask what that splatter on the shelf in the picture above is. I've asked myself the same question and I've come to the conclusion that you just don't ask questions about splatter that was there when you moved in. It honestly is just melted crayon or something but still. We don't talk about it. While he went out to the garage and started cutting up the boards, I slapped on a coat of yellow paint with a brush. You can't tell too much from this picture, but it has a very noticeable brushed-on appearance and it looks really "country" and cute! I thought that the plain, unpainted drywall just looked a little too sad. Plus, it compliments the turquoise-painted sub floor nicely! Then the re-sized shelves went up--wall to wall, might I add--and things were already looking way better than they had before. And now for the finished, reorganized product! All awesome carpentry skills courtesy of Jason. All organizing of food courtesy of yours truly! You could add shelves between the studs on the opposite wall for all your spices and such. Great job!